The first vessel of Crowley’s Commitment (C) Class LNG-Powered ConRo Ships was commissioned in March 2017. Image: courtesy of Crowley Maritime Corporation. VT Halter Marine is building the ships under a contract signed with Crowley. Image: courtesy of Crowley Maritime Corporation. The Commitment (C) Class ConRo vessels will sail between the US and Puerto Rico. Image: courtesy of Crowley Maritime Corporation. The Commitment (C) Class liquefied natural gas (LNG) powered combination container Roll-On/Roll-Off (ConRo) ships are being built by VT Systems’ subsidiary VT Halter Marine for Crowley Maritime Corporation’s liner services group. Crowley signed a contract with VT Halter Marine for two vessels of the new Commitment (C) Class in November 2013. The total value of the contract is estimated to be $350m. The two C-Class ships have been named as El Coquí and Taíno respectively. Construction of the first vessel of this category began in October 2014, with the first steel cutting ceremony at VT Halter Marine shipyard in Pascagoula, Mississippi. The first vessel was delivered in March 2017 and second vessel is scheduled to be delivered in the first half of 2018. The ConRo vessel operates under the Jones Act trade and transports containers and vehicles between the US and Puerto Rico. The Commitment Class, Jones Act ships replace Crowley’s fleet of towed triple-deck barges, which have been operational since the early 1970s. New ConRo vessels are fitted to offer world-class performance and optimum safety, as well as reducing transit times, and setting new standards of environment-friendly shipping. The facility will provide for development of various small and remote offshore fields, which have not been tapped so far for their uneconomical propositions. The Commitment Class ships have been designed by Wartsila Ship Design, in collaboration with Seattle-based naval architecture and marine engineering firm Jensen Maritime, a subsidiary of Crowley. Jensen also manages and supervises the construction activities at the shipyard. 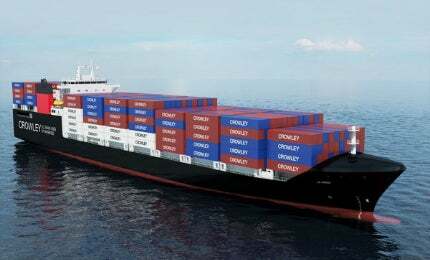 Double-hulled ConRo ships are designed to carry 2,400 TEUs (20ft equivalent units) with a standard length of 20ft to 53ft, and width of 102in. The vessels will also offer enough space to hold up to 300 refrigerated containers. They will also have extra space to accommodate 400 cars and larger vehicles in an enclosed, well-ventilated and weather-insulated spacious Ro/Ro garage. The Commitment Class has an overall length of 219.5m and beam of 32.2m. The depth and draft of the vessel are 18m and 10m respectively, and the deadweight is approximately 26,500t. The vessels will be highly energy-efficient and are expected to receive the CLEAN notation, as well as the Green Passport issued by Det Norske Veritas (DNV) classification society. Commitment (C) Class ships were assigned the DNV class notation and classified as 1A1 general cargo carrier, container, Ro/Ro, Nauticus (new building), gas fuelled, drawn, ground and polished (DG-P) BIS, TMON, BWM-T, E0, NAUT-OC, CLEAN. The main propulsion and auxiliary engines of the C Class vessel is powered by LNG. The use of LNG eliminates sulphur oxide (SOx) and particulate matter (PM) emissions. It also reduces nitrogen oxide (NOx) and carbon dioxide emissions by 92% and 38%, respectively. Dual-fuel vessel uses LNG as primary fuel and can also operate on traditional ultra-low sulphur diesel oil. The propulsion system allows the vessels to sail at a maximum speed of 22kt. Cryonorm designs and supplies LNG marine fuel systems for both inland waterways as (short) sea-going vessels.